What is the $100 per month Challenge? The goal for the course is simple: earn over $100 per month online on a consistent basis by selling your own product or service. If you have an idea for a guitar related book, course or some other guitar related product or service you could sell online, this course will help you take your idea and turn it into a source of income. Why the $100 per month target? 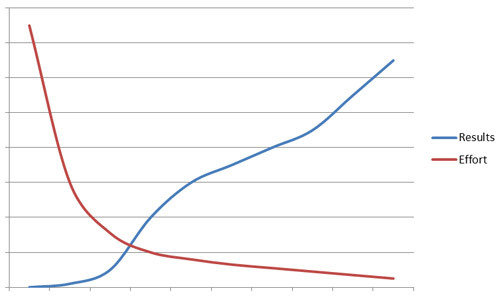 The tendency is to think that after a very short time there should be a huge jump in results (blue line) for the effort you put in (red line). Because we hear so many people talk about 'overnight successes', people tend to think that they should be able to earn large amounts of money online in a very short time as shown by the blue line. 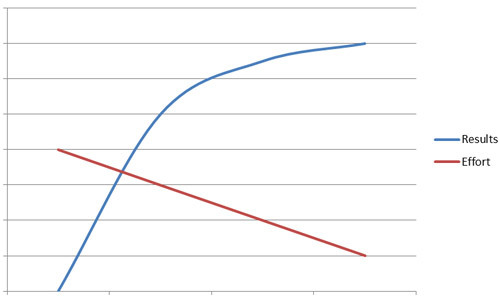 At the same time they feel that the effort needed is minimal as shown by the red line. Here you can see that a lot of effort is required in the very beginning with almost no results. It takes a lot of work for any results to appear. Eventually the results do catch up to the effort put in as shown by the blue line. You can see that by the time the blue line crosses over the red line, a massive amount of effort has already been put in. That's why so many people quit too early - because they don't realize that the results come after the effort. 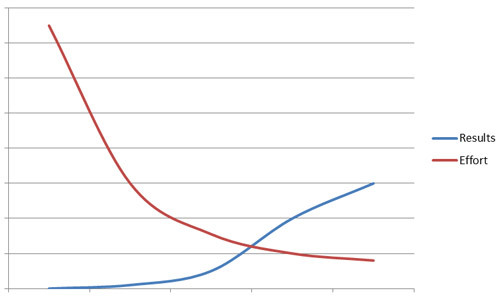 Many people quit before the blue line crosses over the red line and miss out on all the benefits that follow. That point where the blue line crosses over the red line is generally around $100 per month in income. As you can see, the longer you can stick it out and put in the effort required, the more chance you have of achieving great results. The reason why this challenge is for 'online income' is that over time the amount of effort you need to put in dramatically decreases to the point where you can basically leave it running on auto-pilot. It is very possible to reach the point where you are earning $1000s per month from an online product or service. The purpose of this course and the $100 challenge is to put you in a position where it's possible to achieve $1000 or more per month. We can look at this in a different way too: around 80% of the total effort you need to put into selling product happens before you reach $100 per month in income. So after you reach your $100 per month target, you know that all the hard work is behind you. Ongoing effort will still be needed to grow your income, but that work is minimal compared to in the beginning. In short: most people give up too early because they expect high results too soon. Earning $100 per month is a good target to aim for as that's the hardest part. Once you reach $100 consistently per month, you will know you're able to succeed. This course covers a difficult topic and requires that you already have a firm business foundation set up. You must complete the Business Fundamentals Course before you can commence this course. We also highly recommend you complete the Marketing 101 course as having a strong understanding of marketing is crucial to being able to earn an income online. This is a self-guided course which means you can spend as much time as you like on each module. Rushing through the course won't help you succeed with the challenge. Your best approach is to take your time and make sure you apply all the advice given in a module before moving on. Help and support is provided along the way to make sure you're on track to achieve the $100 per month target.